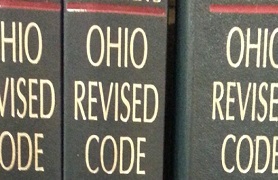 Ohio Revised Code Section 5301.07 governs validating recorded real property instruments and allows for defects, which may include defective certificates of acknowledgement, to be cured. In certain cases, such defects were the subject of hyper-technical attacks challenging the validity of the real property instrument. For instance, if the validity of a mortgage was to be challenged based on a technical defect, such challenge may result in the non-enforcement of the instrument against the person who signed it. To be cured, the current version of the statute requires that the instrument be of record for more than 21 years in the recorder’s office in which the real estate is situated. That the instrument is valid, enforceable and effective as if in all respects the instrument was legally made, executed, acknowledged, and recorded. These presumptions may be rebutted by clear and convincing evidence of fraud, undue influence, duress, forgery, incompetency or incapacity. The new ORC 5301.07 ensures the validity of real property instruments, improves the efficiency of county recorders by allowing them to focus their reviews on substantive issues, and helps to promote and facilitate real estate transactions. If you have questions regarding Ohio’s Curative Title Statute, please contact one of our real estate attorneys.